Dr Peter Sharpe, Associate Medical Director for Research and Development at the Southern Health and Social Care Trust, Dr David Brownlee, Innovation Advisor at HSC Innovations, Dr David McEneaney, Consultant Cardiologist, Southern Health and Social Care Trust. 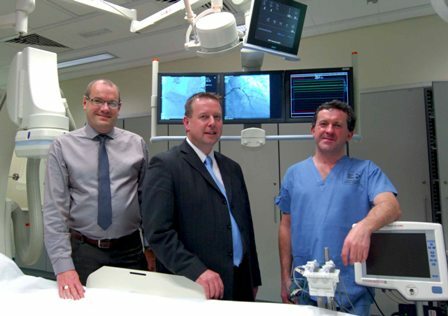 HSC Innovations has awarded funding through its Technology Development Fund for technology development and prototype production of an endovascular imaging device, a new way of imaging blood vessels and the heart. The idea for the endovascular imaging device was Dr David McEneaney’s, Consultant Cardiologist, Southern Health and Social Care Trust (SHSCT). HSC Innovations then worked with Dr McEneaney in assessing the potential of the idea, which addressed a significant unmet clinical need and would have a compelling advantage in enhancing success during the surgical removal of implanted cardiac devices. Based on forward-looking ultrasound, the device may also find application in the arenas of cardiac catheterization, peripheral vascular disease and gastroenterology. HSC Innovations has filed an international patent application on the technology idea. There are rare occasions, usually in the case of malfunction or infection, when it is necessary to remove these cardiac devices. This carries a significant risk of complications due to damage to the blood vessels or heart.